The CDG has arguably been the most widely used overcurrent earth fault relay ever produced. Available in several case formats, many were produced in the same case style that the withdrawable P&B Golds relays was supplied in, hence a Golds retrofit can also be a CDG replacement simply with a change of software switching the function from Motorvision to Feedervision. 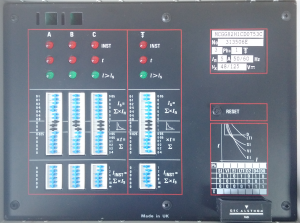 The MCGG and K series was another widely used overcurrent earth fault relay from GEC Measurements later, GEC Alsthom and originate from a relay family referred to as ‘midos’ relays. P&B can provide direct plug in replacements for almost all MCGG and KCGG relays, The P&B midos connector is compatible to the GEC type and allows the existing case to be reused. Meaning a retrofit involves replacing only the protection relay body and avoiding any changes or alteration to the control wiring side. The alternative P&B unit can be equipped with modern and multiple communication protocols (RS485 modbus, DNP3, IEC61850), so system enhancements can be undertaken in the speed it takes to withdraw one relay and replace it with another. The MSP is a range of overcurrent, earth fault and voltage based microprocessor protection relays predominantly for use on single phase systems. The vision 100 series relays offer the same functionality, form and fit although designed for 3-phase systems provision has been made within the 100 series firmware to turn off unused phases allowing any relay to be used as a replacement for the MSP. Transformer, Feeder and Generator based protection relays providing overcurrent earth fault and voltage combinations. The MIRI was configured by switch set positions whilst the MRI was configured by a 7 segment display and LED indication. The vision 100 series relays offer the same functionality, form and fit, in some cases relays have been design a direct pin for pin equivalents, whilst other relays a modicum of minor terminal repositioning. The TJV was an electromechanical relay fitted within Reyrolle’s own withdrawable chassis design and similar to the GEC and P&B Golds chassis. Using the P&B Golds retrofit concept, P&B can provide a direct replacement for motor overload and earth / overcurrent and earth fault protection using a vertically mounted Motorvision / Feedervision relay. When using the drawout chassis, the existing relay electromechanical elements are removed and the vertical Motorvision relay is mounted to newly fitted stirrups, the terminals are then wired directly to the existing contacts of the chassis.